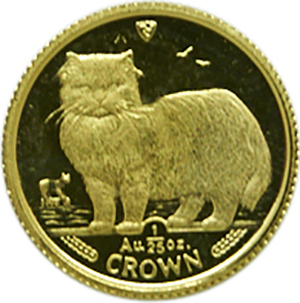 The 1/25 Elizabeth II Crown was part of a collection of products produced by the Pobjoy Mint, sometimes referred to as the Cat Series. The collection includes The Manx Cat, The Himalayan Cat, and Persian Cat. 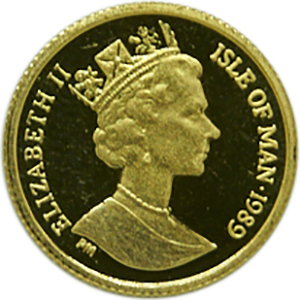 The series was produced in the Isle of Mann in 1989 with a limited number of the coins being released to the general public. This has made the coins particularly sought after by collectors. The 1/15 Elizabeth II Crown has proven to be one of the most popular, and affordable collectors items over the years, with Chinese civilisation, Islamic civilisation and Roman Empire series being released over the reign of the monarch. The coin itself has a face value of £0.01, with the full Crown originally worth £0.25, which essentially makes them pennies. The true value of the coin, however, is much higher. The design depicts the monarch’s figurehead on the obverse, as is customary, and the relevant cat on the inverse. The Manx Cat has proven particularly popular, with its missing tail and links to the Isle of Mann itself. It has a diameter of 13.9mm, a weight of 12.441g and a “Reeded” edge. It was engraved by the world-renowned engraver Raphael David Maklouf. The fine gold purity of the 1/25 Elizabeth Crown is extremely high, 0.9999%, or 24 carats. This puts it among the very purist gold bullion coins in the world today and makes the coin particularly valuable. Due to its high collectability, it is typically priced beyond the value of its gold content alone. The Pobjoy Mint is a highly respected, private sector mint that was founded in the mid 1960’s. It has produced currency for countries on all four corners of the globe, including Hong Kong, Spain, Bolivia, Nigeria and Tanzania.